Muscle Man was busy so I thought it would be FUN to try to push 90lbs of Little Stud and the HEAVY double Jogger solo. I got the boys snacks and closed the garage door.. Just then I realized one of the wheels was a little flat, URGH!! Not wanting to stop and make the guys wait, I opted to chance it.. The first mile was GREAT, our neighborhood is pretty hilly, and the first mile is mostly downhill. The boys were cute chatting away saying "Hi" to people and pointing out every "Daddy Car" and "Sheriff Car" in site. I am barely strong enough to turn the jogger, and with the semi-flat tire this made for some SLOW turns. First mile chimed 8:11 NICE!! It was time to cross the street and I realized the sidewalk did not have a break in it. I had to stop and lift the front wheel. I was starting to get TIRED so I gave the boys a BIG PUSH and ran behind the stroller.. Well they loved it and thought it was a game "Do it again Mommy!" I would hear that phrase over and over the next 2 miles.. I could feel my pace slow but I could not do anything about it, pushing and running is tough work. LS#2 to Big Brother who was resting on his legs "Are you tired?" LS#1 "No I am not tired." PAUSE.... LS#2 "Are you tired?" Irritated LS#1 "No I am not tired!" Mommy "He thinks you are tired because you are leaning on your legs, sit up." LS#1 to his little brother "Are you tired." I added a little loop around a neighborhood so I would end with 3.11. the last bit is a steady incline... 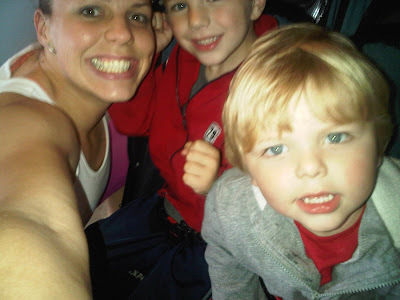 The boys cheered me on "Go Mommy Go!" We made it to the top, successful solo Double Jogger performance 28:20 and just over 9:00 pace.. Pushing 90+ pounds of wiggly toddlers up and down hills earns me the title of SUPER MOM for the day!!! My Boys only weigh in at 50 lbs and I have a hard time running with them in the stroller. Mostly because somehow I get totally uncordinated when I don't have my arms. Beginner runners need their arms to run! Way to go SUPER MOM! For sure, you get the SuperMom title. I hated pushing the tiny 3 y/o in ours so much I gave the stroller away. Your boys are too cute! Great job, Supermom! aw, your little cheering section!! great job and cute pic! Hell yeah that earns you the Super Mom award! Heck ya - you're super mom! And a fast pace at that! When school is in I take my toddler in the jogger and he loves it. We have the best conversations. So cute. You definitely earned your title! Sounds like fun! I wish I had been able to stay in town longer so I could have joined you on a family run with the jogger! Ahhh! this post made me tired just reading it! I retired my stroller almost 2 years ago. YOU ARE SUPER MOM!!!!!!!!!!!!!!!!!!!! High five yo! Super Mom, indeed! Nice work, girl! WOW can't imagine pushing two kids while running!! great job! nice job! sounds like a tough workout!! definitely super mom!! I refuse to run and push the stroller! I may be forced to this week with my husband gone for 2 weeks and Portland around the corner...however, paying a babysitter might just be worth it to get in a training run sans jogger! Way to go Super Mom! I remember jogging strollers and I hate them! oops - sorry about the double post! Hats off to you! That's a lot to push on a run...but it'll make you stronger. I once read that Kami Semick would put her 4 year old daughter in a backpack carrier and run trails with her in there. It must have helped because Kami tears up the trails. the first time I attempted Harlem Hill (a dreaded hill in central park) I was really struggling when I was passed by a woman pushing a kid in a jogging stroller up the hill. Now, whenever I get to that hill I always think "if that woman could push a kid in a stroller up this hill, I can get myself up it!" 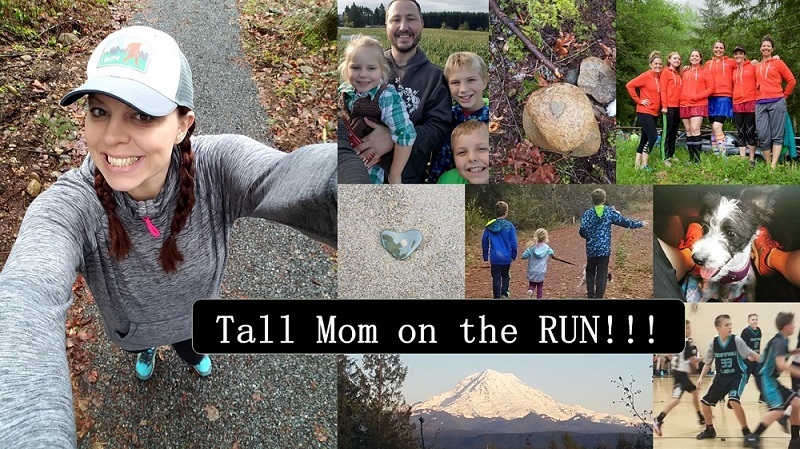 Great motivation for other runners to see you and other mom's/dad's out there running with kids! Ha, I love it. Great story. Even before today I thought you were a Super MOM....for reals. You ARE a super mom! And you have Super cute kids! Awwww, very cute pic of you and the boys :). No doubt! You earned super mom...and isn't there a crown to go with that title?!?! Whew! Nice job Super Mom!!!! No doubt about it, you definitely earned the SUPER MOM title! 90 lbs. and hills?!?! DANG! Super mom. Rock Star. Same thing.